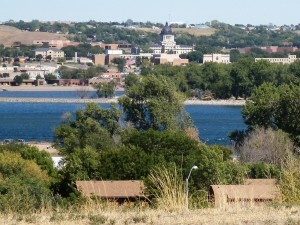 Linda Burton posting from Pierre, South Dakota – From missionaries to movie makers, fur traders to cattle ranchers, expeditionists to archeologists, they have come to Fort Pierre. Fort Pierre lies just across the Missouri River from the capital city of Pierre, but it’s a major crossing, moving you back in time. 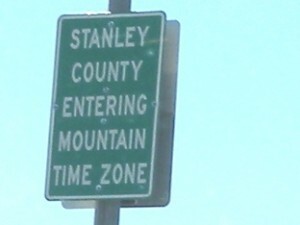 Literally, right in the middle of the river you change from the Central Time Zone into Mountain Time. And with a little imagination, you can historically go back hundreds of years. Can you imagine the Lakota Sioux living here, with hundreds of tipis and thousands of buffalo spreading over the hills? Can you imagine two brothers from France digging a hole high on a hill above the river in the dark of night, and burying a secret? Can you imagine Meriwether Lewis and William Clark stepping ashore to explore the golden hillsides for flora and fauna, documenting the west? 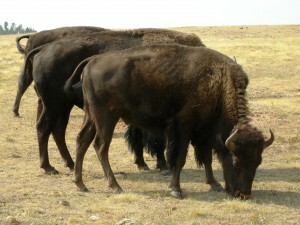 You can still see buffalo herds today, and that secret object that was buried high on that hill. You can see artifacts and remnants left by the adventurers of long ago, and you can walk their path. And if your imagination is lacking, you can rent movies that will recreate the scenes before your very eyes. 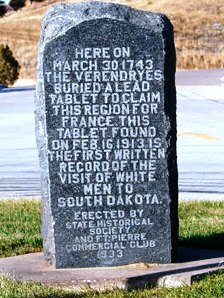 For secrets, go to the hilltop Verendrye Monument National Historic Landmark, where on March 30, 1743 the French-Canadian Verendrye brothers buried a lead plate. They told the local inhabitants they were commemorating harmony with the native peoples; but in fact they were claiming the area for France. The plate was discovered by high school students on February 16, 1913 and is considered one of the most significant historical finds in the northwestern United States; it is the first written record of the visit of white men to South Dakota. For expeditions, think Lewis and Clark, whose journey came close to ending here. On September 24, 1804, they anchored about 100 yards from the mouth of the Bad River and had their first encounter with the Lakotas. There were tense moments and shots were fired, but the day ended with a celebration. About 70 men from the Expedition were hosted at a feast; the meal consisted of cooked dog, dried buffalo meat mixed with grease, and a dish of ground potato; it was served on platters and eaten with horn spoons. The festivities included a parade, a dance, and a Council meeting with Chief Black Buffalo and his braves. Lewis and Clark stopped by again on their way back in 1806; likely feeling right at home. Today Highways 1804 and 1806 commemorate their journey. “. . . a strange mixture of Americans, English, Irish, Swedes, Norwegians, Russians, Poles, French, Canadians, half-breeds, Indians, and what not. . . . Protestants, Catholics, Spiritualists, Moralists, Liberals, Freelovers, Ingersolites, Nothing-arins, and how many others I do not know . . . .Nearly all the people were in hot and eager pursuit after the almighty dollar! 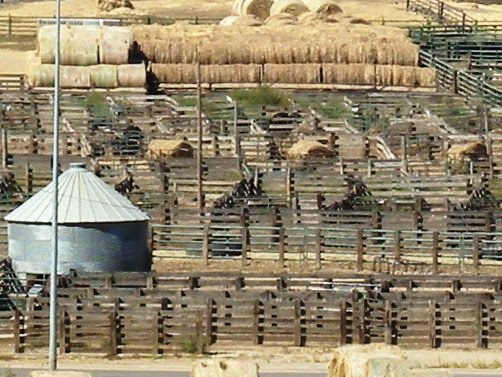 Freighters and cowboys and adventurers from nearly all over the world were duly represented, and there was one continued white heat of excitement week days, Sabbath days, and all. The night before I got there two young men, stimulated by whiskey, drew their pistols on each other in a miserable dance house, and one of them fell dead at the feet of his assailant, and in a few hours was buried on the hillside just back of the town, without hardly more ceremony than if it had been the burial of a dog! It was indeed first-class missionary ground without any mistake.” From: History of the United Church of Christ in South Dakota 1869-1976, Edward C. Ehrensperger, Editor; 1977 by United Church of Christ in South Dakota. And so we’re back to missionaries! A great travel in time, just across the river.